Dining at the Sofitel Grand Sopot is an experience on its own. Fusing French techniques with Polish flavors, each dish offers guests an inspiring look into fine dining at one of Poland’s most beautiful resorts. While staying at the Sofitel Grand Sopot, guests will be able to taste seafood straight from the Baltic Sea at the hotel’s Art Deco restaurant. 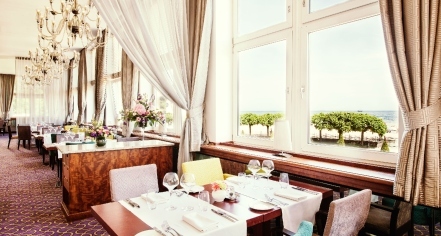 The culinary gem of Sopot features huge windows with a unique view of the historic pier, beach, and sea with interiors decorated in warm shades of brown, violet, and gold. Guests will notice that this specialized menu offers seasonal ingredients cooked with a combination of traditional Polish and French techniques. This renowned restaurant is the perfect option for a family breakfast, business lunch, or romantic dinner. The perfect place for an informal get-together with friends or business partners, Le Bar is a modern interpretation of Art Deco style in the heart of the Sofitel Grand Sopot. 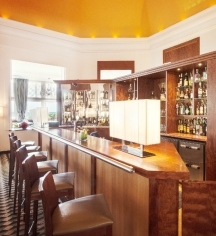 Guests can choose from a selection of herbal teas, expertly crafted cocktails, or fine French wines and champagnes while they dine on upscale snacks like Polish cheeses and caviar. Guests can relax in this lobby bar as they sit in velvet armchairs and listen to live musical entertainment on Fridays and Sundays.